For the 45th time, Portugal is going to participate in the Eurovision Song Contest. The first Portuguese entry was submitted in 1964 called “Oração” by António Calvário, which did not receive a single point. Unfortunately, the Portuguese entries have often been suffering from the “not being noticed” or “not my cup of tea “-phenomenon. Probably, Portuguese music is not that happy, of course the typical music genre in Portugal is Fado. From Fado many songs have been inspired to represent Portugal in Eurovision. The best places lately were “O Meu Coração Não Tem Cor” by Lúcia Moniz (#6) in 1996, “Chamar A Música” by Sara Tavares (#8) in 1994 and “Lusitana Paixão” by Dulce Pontes (#8) in 1991. In the three previous years, Portugal always made it to qualify from the semi final into the big final. Many countries have profited from televoting, countries like Turkey and Greece have not been successful in the 80’s and 90’s, mainly due to the jury voting. So probably, Portugal also proofed good positions with a higher music standard. This year it looks a little bit different again. In the national Portuguese selection, there have been many songs with an international format and potential. The winner was a surprise to the audience and there were “boos” in the arena. The people went out of the auditorium before the show was over and did not give the respect to the winning song and performers. Honestly, it’s a quite weird entry. If you close your eyes and just listen to the music, it’s a quite ok song, very Portuguese, absolute non international. But if you open your eyes and watch the little demonstration, the song is really obtrusive – a no go. The group has been fit up with signboards, protesting on stage. 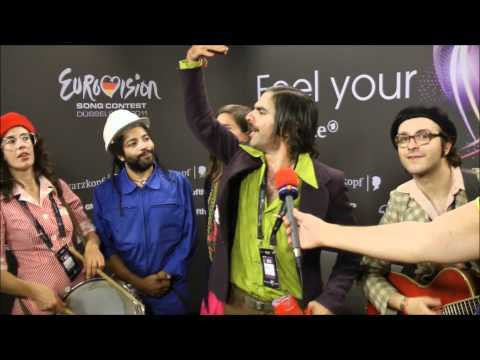 In a way the Portuguese answer of “YMCA” by Village people. It’s a miracle that this song could underway the EBU rules, as it is not allowed to have a clear political message. Sorry Portugal, but this song will fail.